Like so many thirty something’s who grew up sitting in front of their televisions, waiting to watch Michelle put up her toddler hand and exclaim, “you got it dude,” Stephanie to declare “How rude!” or Jessie after kissing Becky respond “Have mercy,” have been counting down the days until Netflix premiered their new spinoff of FULL HOUSE aptly titled FULLER HOUSE on February 26th. I cleared my afternoon schedule, got my snacks ready and invited my ten-year-old daughter and eleven year old son to watch it with me, excited to share the same experience of watching wholesome family programs I had when I was a child. As someone who grew up watching TGIF, ABC’s Friday night block of family friendly shows, this has been a section of television that has been sorely lacking over the past decade. 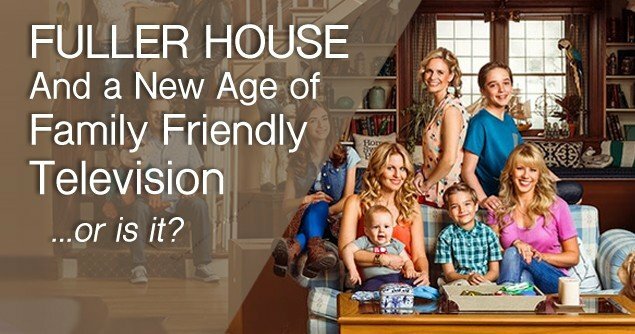 Just as I thought the days of squeaky-clean comedy were over, FULLER HOUSE appeared on the scene, in the hopes to restore that once long forgotten age. From the first episode to the last, FULLER HOUSE encases every cheesy catch phrase we remember from FULL HOUSE in a highly inappropriate and all too familiar package. Candace Cameron Bure reprises her role as DJ Fuller, taking on the role Dad once had of a widow struggling to care for her three children, while enlisting the help of middle sister Stephanie, played by Jodie Sweeten and annoying neighbor Kimmy Gibbler, played by Andrea Barber. Bob Saget, John Stamos and Dave Coulier have guest starring roles, allowing the show’s plot to focus on the kids, with the dads taking a backseat. I get it. Life has changed, as evidenced by Stephanie’s constant selfie taking, DJ’s shameless plug to watch the View or Kimmy’s jokes about adultery and divorce like its no big deal, but for just a few hours, fans want to plunge themselves into a world with super cute kids, squeaky-clean images and where major dilemmas are solved with a hug, a moral lesson and a piece of pie at the dinner table. Unfortunately, fans of wholesome family viewing may have to wait a little longer. Michelle S. Lazurek is an award winning author, speaker, pastor’s wife, and a mother. She is a member of the Advanced Writers and Speakers Association and writes articles for places such as Gifted For Leadership and Encouragement Cafe. her newest book An Invitation to the Table: Embracing the Gift of Hospitality, explores hospitality as a link to discipleship. Please visit her website at www.michellelazurek.com. Is Originality Fading in Hollywood?